Allow me to paraphrase from the box history. The D.VIb was the last design from LFG to reach production status. Unlike the elegant, but underpowered D.II 'Haifisch', this was powered by a Benz Bz.IIIa engine of 185 hp. Entering service in mid 1918, the D.VIa was a 'clinker' construction which allowed for a light but strong airframe that required little maintenance. This type of fuselage construction did not require fabric covering, which eased building and repair. As esthetically pleasing as the D.VI was, it was not that much of a performance improvement over the Albatros D.V and was totally outclassed by the Fokker D.VII that entered service about the same time. The result was that it was used more as a fighter-trainer in operational squadrons to prepare pilots for the higher performance Fokkers. Post-war, the US tested an example and used it to test various camouflage patterns during 1920. Its fate is unknown, but it was probably destroyed soon after. For those of you who don't know, Blue Max is one of the various 'brands' from Pegasus of England. 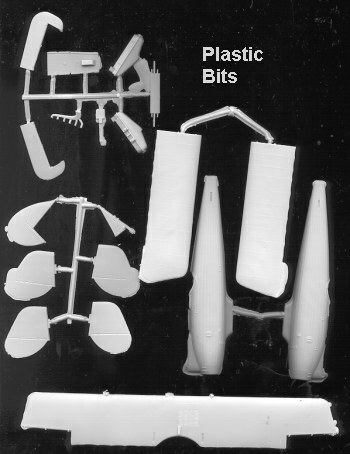 They provide a variety of short run kits for enthusiasts and concentrate on WWI kits in 1/48 scale. For the Blue Max folks, short run means that the base airframe is in low pressure-molded plastic that is a bit softer than the norm, with any of the difficult detail parts being cast in pewter. The detail level on the plastic parts is quite good with crisply done detail where it is needed. They also do not have the 'hills and valleys' type of fabric covering on the flight surfaces, which will please many. The pewter parts are very well cast without the pits and mold misalignment that one finds with some other (French) kits that offer these types of detail parts. Both types of material show only a small amount of mold flash which can be easily removed. The parts are packaged in small zip bags. I found the more petite or thin metal parts to have been rather badly misshapen during shipping so some careful tweaking will be needed prior to use. 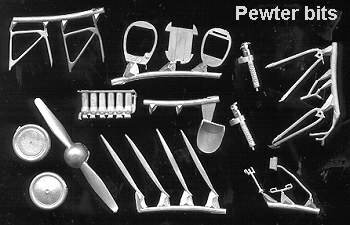 Metal is used for the prop, wheels, guns, seats, struts, engine, cockpit enclosure and some other minor fittings. The injected parts include optional horizontal stabilizers for one of the two decal options. The ailerons are provided as separate items and for those wishing to cut and reposition the rudder and elevators, this will be quite simple, thanks to the softer plastic used. Instructions are a single sheet with an exploded view of all the parts. Thanks to the simplicity of WWI aircraft, this is sufficient. There are also some well done photos to help in construction of interior parts. Detail photos and overall shots of completed models are also provided. The i nstructions have detailed color information as well as equally detailed decal instructions. Color info is provided in FS, Methuen and Xtracolor. It is highly recommended that the Windsock Datafile on this plane be used during construction. Decals are provided for the insignia and special markings. The lozenge used will have to come from an outside source, but there are a number of decal companies that produce very nicely done sheets of this material. No rigging diagram is provided, but the box art should suffice and I'm sure there is one in the reference. This is a kit for advanced builders who are used to tackling the challenges often provided by short run kits. 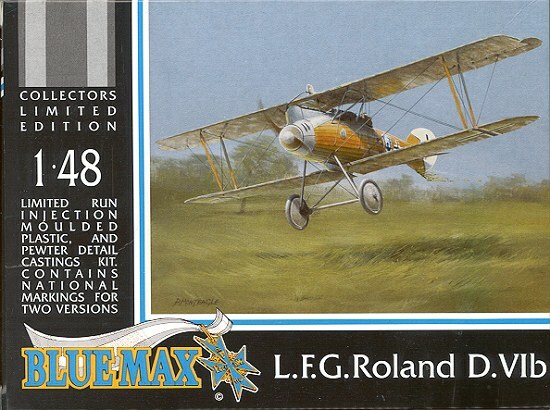 However, it does not appear to be that difficult as these kits go so if you are wanting to try your hand at your first WWI short run kit, this one would be an excellent choice.